Robinsons tour starts with the pristine Wimberley Blanco & Southern RR built by Nick Edwards. Edwards and his buddies are avid steam men, so the layout was designed to be interesting for the hoghead running on external combustion. The long grades and long descents provide plenty of challenge for anyone acting as engineer, fireman, and brakeman all in one. A good deal of the railroad is on 1.5% and 2% grades. The steepest section by Quail Hollow is 2.25% on a curve. For sheer jaw dropping impressiveness, there is one element of the WB&S which stands out above all the others. It is the large two-span Purinton Bridge over the dry creek bed. The smaller span would make a substantial bridge on most railroads. It is a through-girder double track 20' span. The main section is a mammoth welded steel Warren truss that is 60' long and 7.5' wide. Next, the director takes you on a tour of Terry McGraths welcoming Annetta Valley & Western RR. This private line is located west of Dallas / Fort Worth. Mr. McGrath has taken a flat, simple landscape and formed it into a hilly, and picturesque layout where riders can seldom see where theyve been or where they are going. The devoted crew often runs with scheduled timetable operations. Finally, Robinson takes us to Roy Pickards Comanche & Indian Gap. Even though most of the railroad is just a few hundred yards from the rest of the railroad there is a wide variety of landscape in miniature. Portions of the railroad run through rolling hills with deep cuts and high fills. There are thick patches of bushes and small gnarled trees that make very believable scale woods. Other areas evoke a sense of broad grassy prairies with sun scorched earth. For the last hundred years the most common form of live steam operations has been heading out on the mainline loop and making sure you didnt run into the train ahead of you. From the beginning Mr. Pickard wanted a railroad that would more closely replicate the activity of the prototype. 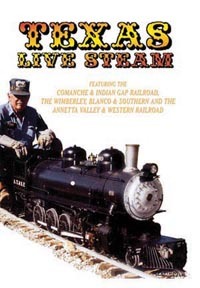 This was a rather revolutionary idea in the live steam world thirty years ago. And the C&IG deserves credit for being a pioneer in live steam railroad operations.